The full version of this post was written and originally published by Gourmet Chick. Thanks! It helps to have friends with their finger on the pulse. I may not have been back to my home town of Melbourne for a good six months, but as soon as I arrived, my friend Joyce organised dinner at the newly opened Saint Peter’s. The restaurant is so new, that it still has a soft opening deal running of 50 per cent off the food bill for October (and now November). Saint Peter’s has taken over the old Canary Club bar in Melbourne Place, one of those typically Melbourne tiny laneways in the CBD. In a nod to the fantastic graffiti art that adorns many of the laneways, some seafaring themed graffiti style art points the way to Saint Peter’s doorway. Inside, the brightly coloured, Spanish influenced style of the Canary Club has given way to smoky glass mirrors, crisp linen table cloths, designer crockery and polished glassware. The whole restaurant has quite a high end feel to it, right down to the chaise lounge and Molton Brown toiletries in the bathroom. Named after the patron saint of fishermen, and with Maurice Esposito at the helm, known for his seafood restaurant in Carlton, it is no surprise seafood is the main event at Saint Peter’s. The restaurant claims that sustainability is a big focus, which is good to know as there is nothing worse than having to stress about whether the seafood you are eating is endangered while you are trying to enjoy your meal. We started with chilled Asahi beers ($9) and a complimentary amuse bouche of parsley salad. Fresh and vibrant in its simplicity, it set the tone for the high standard of produce used in the restaurant. We then tried a selection of the “tastes” which can be ordered individually. Salted cod croquettes ($1) were cracking little cigars of potatoes and cod which had been bread crumbed and then deep fried. The only drawback was that we also ordered the crumbed sardines ($2) which were very similar in both taste and appearance except for the inclusion of pancetta, wrapped around the sardines underneath the breadcrumbs. A word from our waitress about potentially doubling up would probably have been helpful. She also should have warned the person eating next to us not to order six of the sardines all to himself as for a starter it was ridiculously large to an almost comical extent. 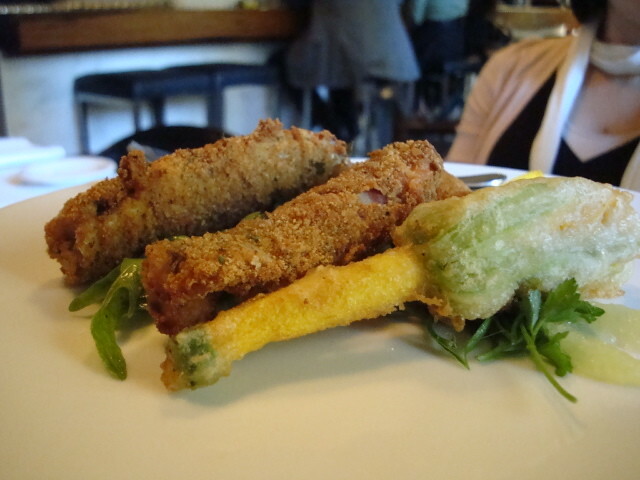 A lighter option was the battered zucchini flower ($7), such an Italian classic and not quite as heavy on the palate. We all selected fish as a main, as with fish there is no hiding place and if the quality or preparation is lacking, you will know about it. 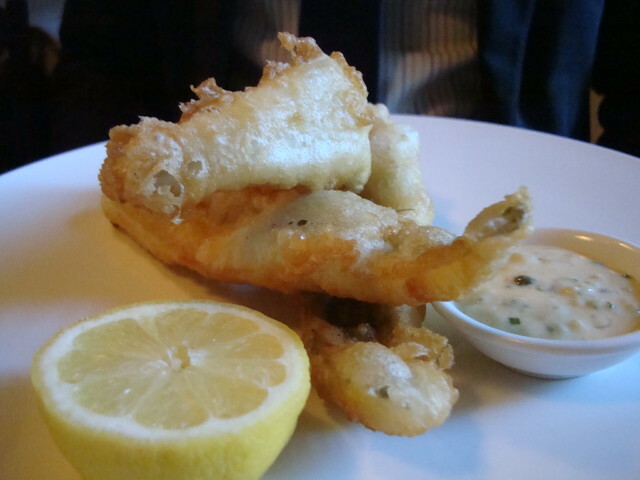 The battered King George whiting served with chips ($42), was really just a posh version of fish and chips at a fairly steep price. I am always a bit disappointed when I order fish and chips in a fancy restaurant, as I think nothing beats ordering them from a chippie by the beach, but RM was satisfied with Saint Peter’s take on this classic crowd pleasing dish. 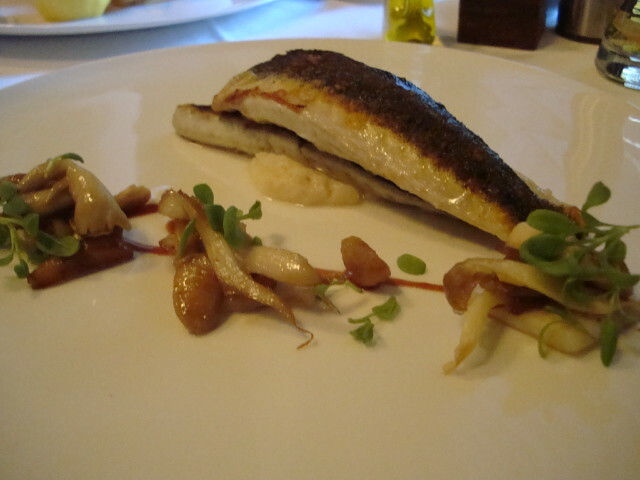 More accomplished cooking was evident in the John Dory ($38) which was served in two fillets on a mud crab ravioli. The fish was perked up with some Cinzano reduction and accompanied by a handful of tender, delicate white asparagus. However, the stand out dish for me was the flathead ($35) which was perched on top of a sweet parsnip puree which cut through the delicate, understated flavour of the fish. Arranged along the side of the plate like tiny bouquets of flowers were handfuls of wild mushrooms bursting with earthy goodness. From the dessert menu we tried the hot strawberry and almond tart ($20) which was served with a scoop of pistachio ice-cream. The tart takes an additional 20 minutes to prepare but was worth the wait for its lovely summery berry flavours. The only draw back was that it was on the small side and the accompanying ice-cream did not really taste of pistachio. 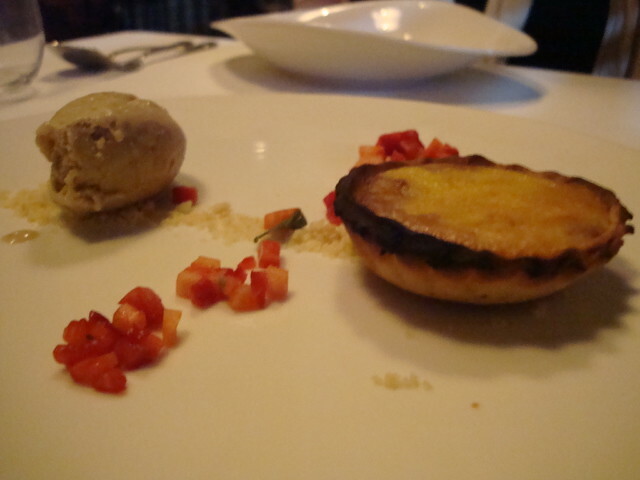 A better option was the cold pressed apple terrine ($18) which was almost like a deconstructed apple pie. It comprised a small slab of slow cooked, chilled apples topped with a scoop of vanilla ice-cream and a wedge of sugary shortbread which added crunch to the softness of the terrine. Service during our meal was a little slow and I think more guidance could have been given at times. Our waiter was also a little strange about the opening special and this was something we had to ask for a few times and did not appear to be offered to diners who were unaware of the discount. However, given this was the soft opening such glitches can be expected and once small issues like this have been ironed out, it looks like Esposito’s CBD restaurant will be just as successful as his Carlton offering. Buckle up for a high seas adventure which really showcases some great Australian seafood. The food looks very tempting – I must give this place a try sometime. It’s a shame they felt the need to paint over the beautiful mosaics of the old Canary Club though. When I took a look at the outside of the building the other day, the new “grafitti” looks very clumsy and child-like in comparison. It rather reminds me of the decor in a McDonald’s party room. that is pretty steep for fish’n’chips. I just went the other day!!! Pretty nice food, though still needs a few minor things to iron out =). How depressing, i didn’t get to try any of the desserts. What did you eat and what minor issues did you face? Will you return (even when it turns to full price)? I would never go back to St Peters again. It was a waste of money. If you want seafood, take your money to Rockpool instead. I mean, St Peters doesn’t even try. This should be a : NOT. Sorry to hear that you didn’t enjoy St Peters. What did you not like about it? The food, the service, the ambience? I just love having sea food.My mouth is watering while I was seeing the above pics.I have not been to Saint peters.Ya cool I will try to go on this weekend.Because I am eagerly waiting to taste the food.